Home » Art » Fact or Fiction? It seems like all we talk about any more. Reality. What is true and what is fabulist. Are we getting the facts—are they clear, nuanced, embroidered, biased or fabricated? Is the truth fixed and knowable? Touching on this trenchant topic is that latest seasonal offering from Kaneko, Reality, which opened to the public on June 1 and runs through September 26. Typical of this venue’s offerings, the exhibition provides multiple entries to the topic’s broad implications, primarily through the avenues of art, science and technology. The first section of the exhibition presents forms of virtual reality. A room devoted to tech-tools for learning features an array of dimensional visualization techniques from the iEXCEL program at UNMC. Its use of holograms and simulations educate medical practitioners by engaging them in a more sensory way with human anatomy and enable them to practice techniques in the lab before applying them to living subjects. Kaneko also invites visitors to indulge in a little nostalgia by playing in a forest of Viewmasters, those mid-century toys whose film reels transported you to faraway places. At the same time, if offers the latest gadgetry, as virtual reality goggles send you inside a kaleidoscope, on a tour of the as-yet unbuilt Kaneko collection building or soar like a bird above Omaha. In the Bow Truss gallery is a near-retrospective of Misha Gordin’s conceptual, black-and-white photographs of the human figure. Whether alone in a disquieting landscape or a face in a sea of undifferentiated heads, his subjects are not portraits, but emanations of humanity. Their faces and postures seem to indicate a painful desire for recognition, identity and purpose; the gripping formal and emotional tension in the work is enhanced by Gordin’s marriage of cinematic aesthetic and methodical approach to darkroom montage techniques. In many ways, the seamless manipulation of image and dark humanism of Gordin’s art is a setup for the visitor’s experience upstairs in the Museum of Alternative History, which is the amazing centerpiece of the Realityshow. In this expansive gallery, a forest of vitrines house professional displays of specimens, fossils and artifacts presented with helpfully informative didactics. Yet, nothing is as it seems. As the introductory panel explains, this is no museum of natural history. Rather, it is a highly creative, bold and at times unflinchingly critical take on the slipperiness of truth in the current cultural environment. MOAH is the brain child of Tim Guthrie, an Omaha artist, activist and Creighton professor of graphic design. Guthrie began this project in the early 2010s in response to attacks on education, particularly those efforts by special interests in Texas to demand that textbooks devote significant space to Intelligent Design and climate change skepticism. To that end, Guthrie began making unusual objects that had the look and feel of archaeological finds, familiar yet odd in some way, like mutated human skulls, dinosaur dung specimens and cuneiform tablets for which fabulist backstories might be imagined. He invited other artists to create curious objects and writers to invent credible sounding histories for them. 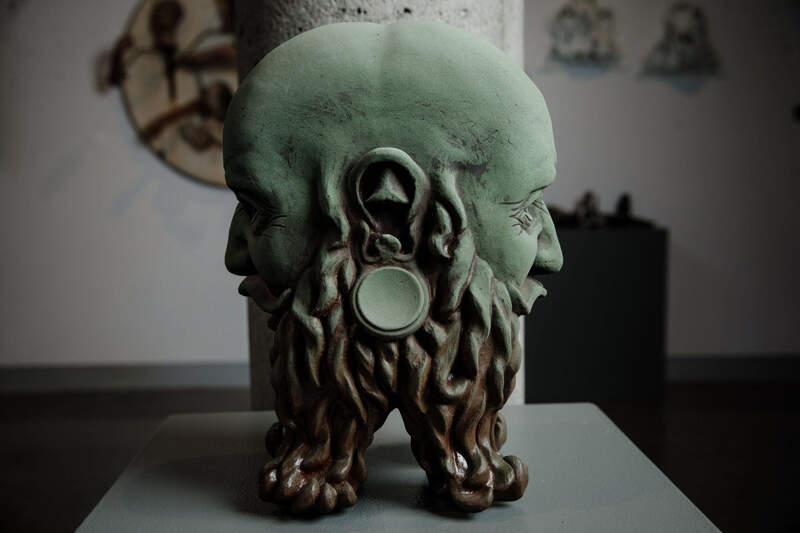 In 2013, MOAH debuted at RNG Gallery, the beginning of an ongoing, evolving collection of relics with intriguing and possibly provocative pasts. For its iteration at Kaneko, MOAH is greatly expanded to include more than 30 artists/groups (including Guthrie as lead artist) making work for the show, with a team of 7 writers headed by Davis Schneiderman, and the aid of editors and a graphic designer to give the presentation a structured and unified tone. The inclusion of a museum shop lends an additional patina of authenticity. Some of MOAH’s displays are decidedly satiric. A didactic label describing the wall of colorful jellyfish constructed from plastic shopping bags (by Andrea Henkels Heidinger and other community participants) tells the origin story of the Snorkel Rider of the Anthropocene. Tongue firmly in cheek, it explains how this figure became the mascot of a floating island of garbage inhabited by the effigies of former Trump administration officials. It weaves a fanciful narrative based on the existence of the Great Pacific Garbage Patch and a range of present-day political policies. 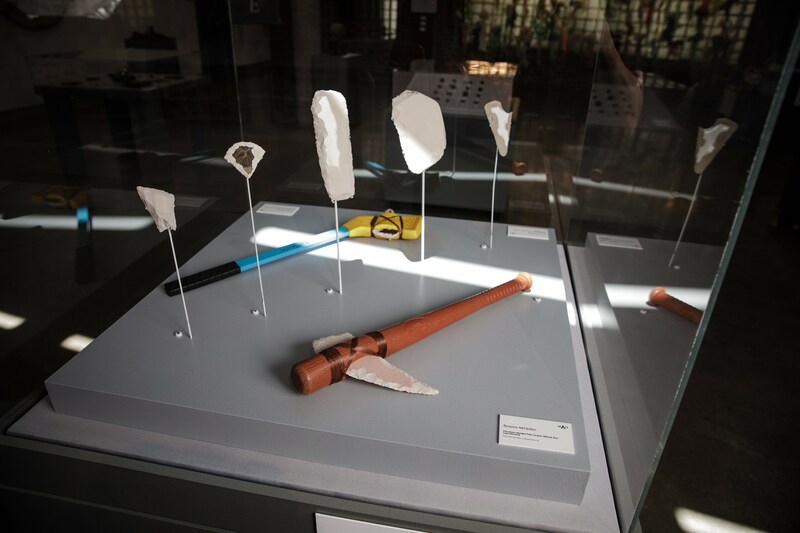 Similarly, Ben McQuillan’s toilet porcelain and plastic toy “archaeological finds” reconstruct implements of a fictive Neolithic peoples, whose weapons are cunning antecedents of today’s sports equipment. 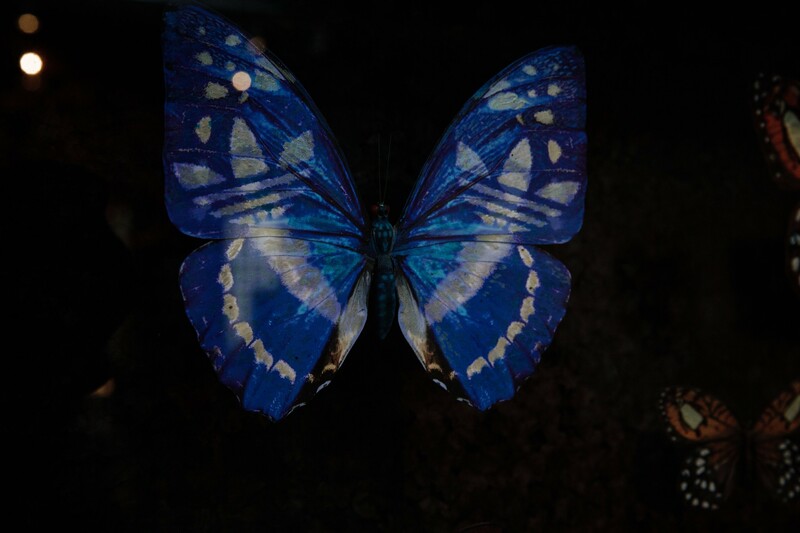 Darker in tone but just as amusing are Tim Guthrie’s mix of actual and created butterfly specimens, which posit that novelist Vladimir Nabokov’s real-life obsession with butterflies was inspiration for certain Koch industry-funded gene editing techniques. Displayed are many varieties sporting corporate branding; this assortment of flying ads elicits a smile as you recognize Adidas, Snapchat and Pringles logos on their wings. In contrast to such humorous objects are the authentic artifacts enshrined in this museum. A variety of intricate Victorian-era hair wreaths and jewelry items are included. Seen by audiences today as variously morbid and curious, such mourning items reflect a popular custom of memorializing the dead by incorporating their hair into wearable or displayable items. Even Reagan Pufall’s stacked bottles and 3D models of praying mantises are based in this artist’s fascination with insect’s perceived anthropomorphic qualities. 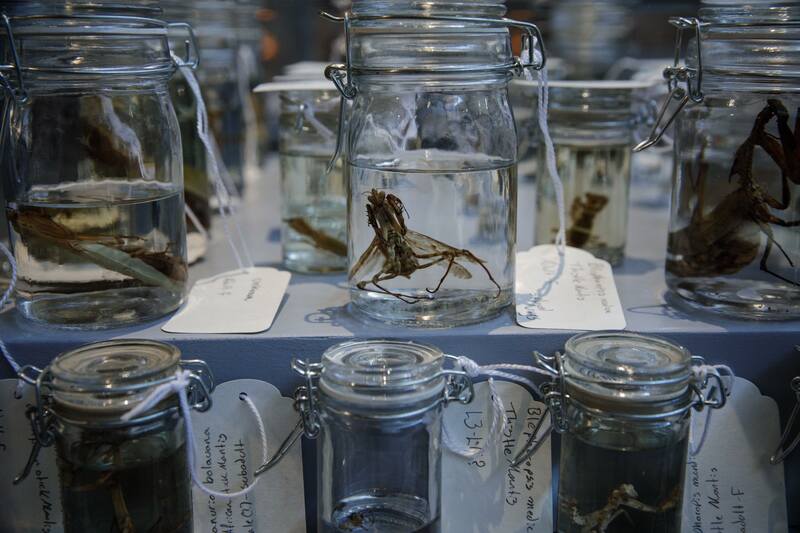 The artist raises mantises and uses them as subjects of his photography and 3D printed sculpture; as well, he collects their molted skins and remains with the fervor of an entomologist. All of which makes it difficult to separate the fact from fiction that is part of the intended friction of MOAH. Museums of natural history are often cabinets of curiosities, presenting the rare and unusual; in this, MOAH does not disappoint. Consider Guthrie’s mutants, including the “’Mickey’ Owl-Monkey Symbiote Specimen #8”, which posits that Disney’s beloved character was inspired by an African archaeological find. Or Andi Olsen’s haunting “Hanged Arc-Angel”, presented as a talisman from a medieval rivalry for Papal supremacy between competing factions in Rome and Avignon. This schism did exist; was this an artifact from it? The truth is stranger than fiction, as the saying goes. In fact, many of the alternative histories are too close for comfort. Brian Wetjen’s geodes filled with plastics instead of crystals make you wonder what geological formations of the future will look like. KayCee Wise’s Audubon-like watercolor studies of birds in nature give pause, as they perch on barbed wire fences and stroll on oil-stained shorelines. Launa Bacon’s “Acts of Faith” is likewise discomfiting and one of a few works in MOAH that deal with religious belief. A pedestal is arrayed with the charred remains of Bibles, a crucifix, gun parts and shell casings; above them hang melted remnants of stained glass windows. While the artist’s intent is not explained, the viewer might easily relate it to any number of recent horrific events committed in the name of religion. Believe what you will, at all costs, it seems to say. In all, Guthrie’s MOAH proposition is conceived of and executed masterfully. It taps into the current zeitgeist, which supports the twisting of fact, skewing of science, and values opinion and belief over data and truth. MOAH uses the mechanisms and methodology of museums to provide a credible foundation for its fictions, not dissimilar to the way in which the Creation Museum explains to its visitors that humans may have ridden dinosaurs. MOAH enlightens, amuses and puts us on notice with its creative vivisection of confirmation bias. Really. Realitycontinues at Kaneko through September 26, 2018. The museum, located at 1111 Jones Street, is open Tuesdays-Fridays from 12pm-8pm and on Saturdays from 11am-5pm. Information on numerous programs held in conjunction with the exhibition may be found on their website at www.kaneko.org. There is no admission fee.